I recently lunched with Dixon, who retired last week, so I could tell you about her legacy -- helping nail serial killer Joseph Paul Franklin and other bad guys; bringing Crime Stoppers to Cincinnati; and helping build Channel 12 from fourth to first place in the news ratings. When Nick Clooney took over as WKRC-TV anchor in 1976, the 11 p.m. newscast was fourth behind Channel 9's "Al Schottelkotte News," Channel 5's news and Channel 19's "Mary Hartman, Mary Hartman" syndicated sitcom. 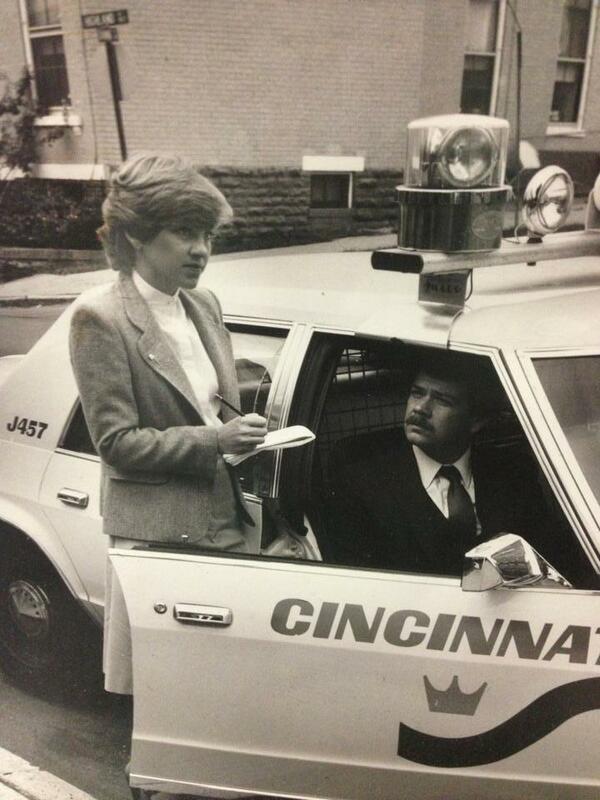 Covering a police story for WKRC-TV in 1984. 1. SHE IS ONE OF CINCINNATI'S BEST CRIME REPORTERS. EVER. How did a nice woman like Deb Dixon become a tough crime reporter? Two words: "Working nights." After graduating from Baldin Wallace College in 1974, she moved to Cincinnati as her sister lived here. She was a waitress and a substitute teacher while applying to TV stations. Eventually WKRC-TV hired her as a newsroom graphic artist for $1.75 an hour. The pay was so low she was eligible for government housing, she says. "But I thought I was the luckiest person in the world… They were so short of people, that eventually they started letting me go out at night to do interviews. Then I produced a little bit. (She was a producer during the Beverly Hills Supper Club fire in May 1977.) Eventually they said, 'If that's what you want to do, you can be a reporter.' I worked nights for seven years, and that's when it (crime) happens." 2. NICK CLOONEY'S CHANNEL 12 VARIETY SHOW CHANGED HER LIFE. "I was a sociology major. I wanted to be a social worker. I came to Cincinnati when my sister was at UC (in 1972), and we went to see the 'Nick Clooney Show' at Channel 12. At the 'Nick Clooney Show,' they let me announce, "Here he is! Nick Clooney!" I watched all the energy, and the camera operators, and all the creativity, the interviews Nick did, and I went back and changed my degree to communications. They really didn't have a communications program, so I had to create my own." 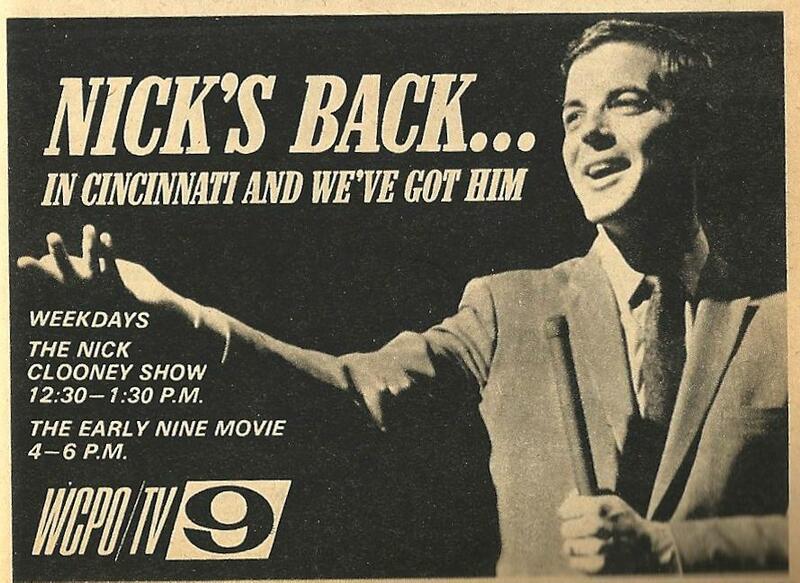 WKRC-TV picked up Nick Clooney's midday variety show after it was canceled by WCPO-TV in 1972. 3. TRACKING SERIAL KILLER JOSEPH PAUL FRANKLIN. "My biggest story was Joseph Paul Franklin, no question." The serial killer was convicted of several murders, and confessed to the attempted murders of magazine publisher Larry Flynt and civil rights activist Vernon Jordan Jr. He was executed in 2013. "He shot cousins Darrell Lane (age 14) and Dante Evans (13) on Reading Road in 1980. Back then, Channel 12 let me go to Mobile, Ala., to find out more about him. I spent days down there, and I found out that they called him "Jimmy," not Joseph. So when he was arrested later in Tampa, Fla., and they sent me down there, and there were all these reporters, I yelled, 'Hey Jimmy!' and he turned and talked to me. "And then we communicated with calls and letters, and I did two interviews with him in prison, for the next 17 years. It was very difficult, because he was such a sociopath, so dark, so evil. Eventually he gave me all the details of how he waited for Larry Flynt in Columbus (OH), and put himself in this abandoned building, and watched Larry Flynt and his people go to court every day in Columbus, and how and why he shot them." 4. HELPING FREE A MAN WRONGFULLY IMPRISONED IN WEST VIRGINIA. Dixon called me one day to say that CBS' "60 Minutes II" was going to do a story based on Joseph Paul Franklin confessing to her that he shot and killed two female hitchhikers in West Virginia in 1980. I interviewed "60 Minutes II" correspondent Charlie Rose about the story. "(Franklin) told me that there is a man in a West Virginia prison for murders he committed, the 'Rainbow Murders.' Two girls, Nancy Santomero and Vicki Durian, were going to a Pocahontas County rally, an environmental hippie thing. He picked them up when they were hitchhiking and casually asked them if they would date black guys. They both said yes, and he just turned and shot them. They later arrested a farmer (Jacob Beard), and got a conviction and sent him to prison. And (my) interview led to the guy (Beard) getting out of prison in 1999. They just were so ignorant -- the police there and the West Virginia State Police – they could not imagine that a serial killer would be in Pocahontas County. So they looked for someone who was nearby that day. And "60 Minutes II" took everything I had." 5. BRINGING CRIME STOPPERS TO CINCINNATI. "The other thing I'm proudest of is bringing Crime Stoppers here. I started trying to do that in 1978. (Then) Police Chief Myron Leistler just didn't want to have anything to do with it. Nobody wanted to work that close to the media. Eventually after a couple of years he said, 'Go ahead. Try it. It probably won't work.' And it turned out to be one of the most successful in the country – not because of me, but because of this 'Not in my backyard' mentality of Greater Cincinnati, and the board that raises all the money. It's a nonprofit. "The first Crime Stoppers aired in 1980. For a long time, we were the only ones who did Crime Stoppers, and eventually they expanded it to all the stations, which was smart. We used to do re-enactments (of crimes). They were very successful. We had one re-enactment that was so carefully put together, like it happened, and the actress was just like the female robber in the security video. The woman (perpetrator) saw it, and thought the camera was there when she did it, and turned herself in!" Vincent Doan was convicted of murdering ex-girlfriend Carrie Culberson of Blanchester in 1996 by a Clinton County jury in Wilmington, even though her body has never been found. "That was a big part of my life. I'm still in touch with her mother. I have to say that was the most brilliant court case I ever sat though. This was in Clinton County, and the defense was a couple of hotshot attorneys from Dayton. They came in and kind of talked above these country lawyers." Clinton County prosecutors "pieced together the most brilliant circumstantial case. That's when I realized that circumstantial is probably better than the battle of forensics and all the experts. All they did was lay it out for the jury to go: 'If he didn't kill her, then where the hell is she?' It was brilliant." Three-year-old Marcus Fiesel died in the care of his foster parents, David and Liz Carroll. They claimed he wandered away from them in Anderson Township's Julifs Park in 2006. Dixon got them to come to her Anderson Township home (at the time) to do a TV interview. "The Carrols came by my house when they finally decided to do an interview. The story they told was that they went to Julifs Park and he disappeared. There was a big search at Julifs Park, and everybody is searching -- except for them, because they knew he wasn't there. It was very tell-tale. The Clermont County prosecutor did a brilliant job on that case." 8. LESSONS LEARNED FROM DONALD HARVEY. 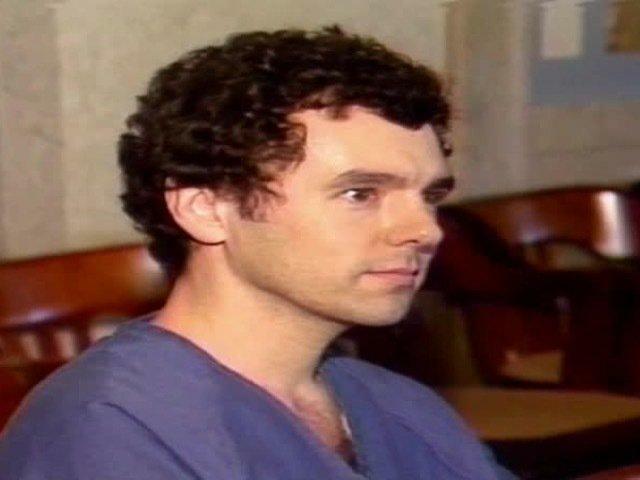 Drake Hospital orderly Donald Harvey, who called himself the "Angel of Death," pleaded guilty in 1987 to killing 24 people. Did she do stories on Harvey? "No. That was all completely done by Channel 9. In fact, that provided a big lesson that I passed on to people in the newsroom. The person who called Channel 9 and told them about this 'Angel of Death,' had called Channel 12 and got blown off by the person answering the phone. So they called someone else. "And I told the people who pick up the phone that you treat each one like they've got something special to tell you." 9. SHOWING A SOFTER TOUCH WITH HUMAN INTEREST STORIES. 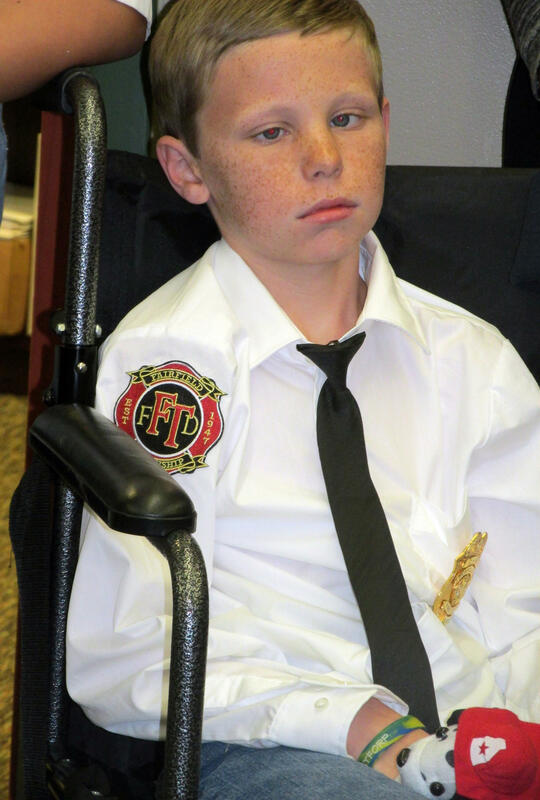 Kyler Bradley was honored by Fairfield Township firefighters in October 2015. "I had a lot of good stories, like little Kyler Bradley of Fairfield Township, who died of DIPG (terminal brain cancer) in 2016 (at age 10). A policeman had called me and said, 'He wants to be an anchorman.' I thought, what the heck, so I met his mother and him at this school in Fairfield. He had just been diagnosed. His mother had already told him, 'You're going to die.' When I went out there, I didn't know that. I let him talk into the microphone, and pretend he was an anchor. I stayed in touch with the family and kept doing stories. The strength of that little kid was so astonishing, how he endured. He did it for his mother, I believe. How brave he was for her. "Toward the end, my stories were less about crime incidents and more stories of the heart. I don't know if that naturally happened, or if my heart expanded. I don't know which." Deb Dixon says she would not have retired if the station owner, Sinclair Broadcast Group, really wanted her to stick around. She also says that Channel 12 has been a difficult place to work, especially after Sinclair ordered local TV anchors – including Rob Braun and Cammy Dierking – to read a corporate script complaining about "the troubling trend of irresponsible, one-side news stories plaguing our country." The spots ran in the middle of newscasts in March, without being labeled "commentary." Rob Braun and Cammy Dierking are seen at bottom left in Deadspin's composite of Sinclair station anchors reading an identical script. "It just broke his heart. It was a very difficult time for Rob. I'd never seen Rob look so bad…. Whatever Sinclair was trying to do, it didn't work." 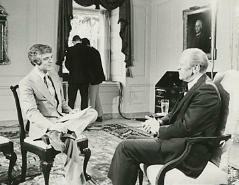 Nick Clooney interviews President Gerald Ford in the White House in 1976. Dixon became a full-time reporter after Nick Clooney was named anchorman. Clooney was the face of Channel 12 news from 1976-84, when he went to KNBC-TV in Los Angeles. He returned to Channel 12 in 1986, and worked several years before leaving the station. "And I do that, and hopefully I passed that on to some of the kids who are coming in and replacing us, because I was like that. When I started, I was the same age as they are now, and people helped me... Rob absorbed a lot from Nick, too." Seeing the worst of people for 40 years, she had to learn to compartmentalize her feelings, much like police and fire fighters do. Meeting crime victims taught her about empathy. "Like cops and fireman, you have to live in two different worlds. You see things in a different way. My daughter would call and complain about something and I'd say, 'I just talked to a mother whose 6-year-old son was murdered, so quit whining.' It does put life into perspective. "Survivors of violence are the most amazing people -- how they find the courage the next day to get up with broken hearts, and day after day, to hope for justice." It helps if you walk in their shoes. One last thing: Dixon was legendary in the newsroom for hugging everyone. A lot. In fact, when Clooney left for Los Angeles in 1984, she was pictured in the newspaper hugging Nick. So if you see Dixon around town enjoying her retirement, don't just say hello or congratulations. Give her a hug. 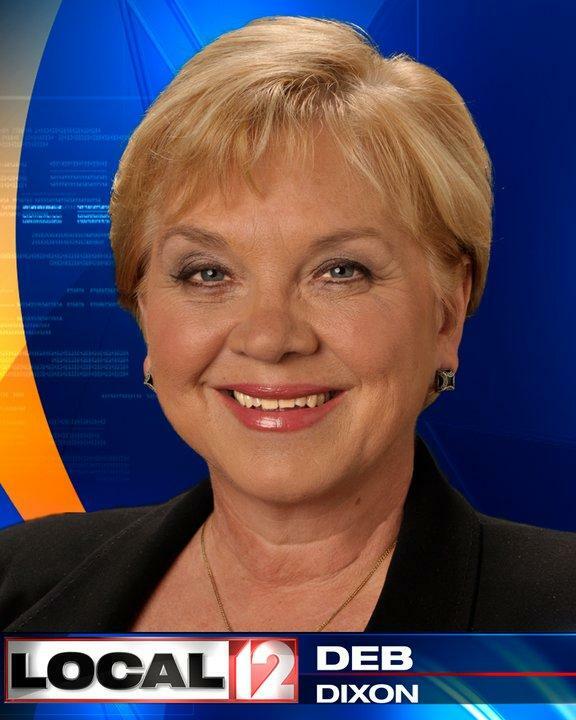 Thank her for all she did at Channel 12, and for making Greater Cincinnati safer.